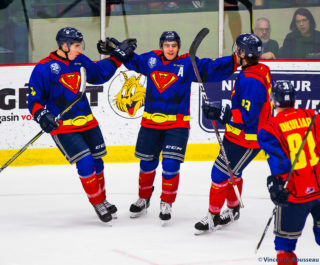 The Phoenix traveled to Victoriaville Sunday to take on the Tigres in the third of their five consecutive games away from the Palais des Sports Léopold-Drolet. After coming up short against the Océanic Friday night Sherbrooke was looking to get a win and back on the right track leading into the holiday season. 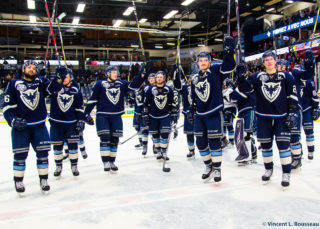 After Victoriaville scored three times to open the game with goals from James Phelan, Félix Lauzon and Mathieu Ayotte. Sherbrooke chipped away at the Tigres and battled their way back into the game in the second period. Sherbrooke was able to get within a score of Victoriaville thanks to goals from Julien Bahl and Yaroslav Alexeyev. Bahl was able to score on a long point shot that beat James Povall through traffic in front of the net. Less than two minutes later on a power play Alexeyev beat Povall with a wrist shot through traffic again from the top of the circle. Before the end of the period Victoriaville countered with two more goals as they took a 5-2 lead to the second intermission thanks to scores from Ayotte , with about three minutes left in the period and Alexandre Goulet, with 4.2 seconds left in the period. Neither team found the back of the net in the third period as the Tigres came away with a 5-2 victory. Sherbrooke out shot their opponent 37-24 in the game. Special teams proved to be a big difference in the game, Victoriaville was 3/3 for on the power play as well as scoring a shorthanded goal. Sherbrooke was 1/5 with the man advantage in the game. 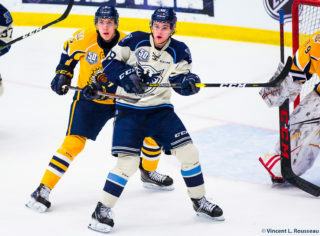 Sherbrooke used both Justin Blanchette and William Giroux in net against the Tigres. Blanchette stopped 8/11 shots and Giroux stopped 11/13 in relief. Sherbrooke will head to Baie-Comeau during the week to play the Drakkar on Tuesday and then Chicoutimi to play the Saguenéens on Wednesday to finish off their five straight road games. 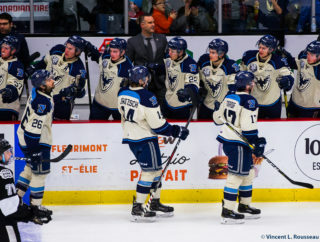 Sherbrooke will host the Drakkar when the Phoenix return to action at the Palais des Sports Léopold-Drolet Friday December 9th.